Advocates for immigrants along the U.S.-Mexico border say a Tuesday decision by U.S. Immigration and Customs Enforcement to no longer provide assistance to migrant families being released from detention may be more rhetorical than real. Until this week, ICE had a policy of conducting “post-release planning” to ensure that migrant families being released in the U.S. had transportation arrangements. But on Tuesday, ICE abandoned the policy, ostensibly in order to release families from detention more quickly and adhere to court orders on the treatment of migrant children. “To mitigate the risk of holding family units past the time frame allotted to the government, ICE began curtailing all reviews of post-release plans from families apprehended along the southwest border,” ICE Deputy Press Secretary Sarah Rodriguez said in a statement shared with KQED Thursday. Immigrant rights advocates say they learned about the policy change only after it was implemented. A Catholic church group in El Paso, Texas, that provides temporary housing for hundreds of migrant families released from local detention facilities each week, expressed concern. In an email to supporters, Annunciation House warned that the group’s shelters could be overwhelmed. But Vicki Gaubeca with the Southern Border Communities Coalition in Tucson, Arizona, said that in recent years ICE has already been making large-scale releases of families without ensuring they have transportation arrangements from border detention facilities. Gaubeca said the ICE policy change seems calculated to give an impression that migrants seeking refuge in the U.S. will overwhelm border communities. But, she said, that has never been the case. 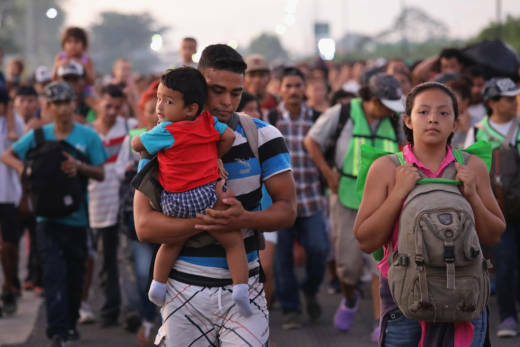 Gaubeca speculated that the ICE announcement was related to an executive order the president is expected to announce next week, aimed at blocking a caravan of thousands of Central Americans seeking asylum in the U.S. In San Diego, advocates also said they had seen no changes to the number and manner of family releases since the government’s announcement. Lauren Cusitello with Crossroads Justice Center, a nonprofit group that provides legal services to migrants, said community organizations in the San Diego can provide a lot of support to migrant families. “There are resources available to make sure that that they are safe and healthy,” Cusitello said. But she worried that if ICE stops reviewing families’ post-release plans, the burden will shift to nonprofit and church groups to locate families and ensure their safety. And that could mean some people don’t get help. “There may be people whose needs go unmet even though there are providers in the community,” Cusitello said. The 1997 Flores Settlement Agreement requires migrant children to be kept in the least restrictive environment possible and released from custody as soon as possible. Children who cannot be released, must be transferred to a state-licensed child care facility, usually within 72 hours. A federal judge has ruled that the agreement applies to children with a known parent as well as those who arrive at the border without their parents. Carlos Holguín, one of the plaintiffs’ attorneys in the Flores case, said the change in ICE policy is “not necessary” to comply with the settlement agreement. That’s because the number of migrant kids has been high in recent years, triggering an exemption to the 72-hour rule.